On July 2nd, approximately 300 Occupy National Gathering protestors and 100 Verizon workers marched through Center City during rush hour. The Corporate Accountability March drew interest from many onlookers, some reaching for their cameras, others cheering on the marchers. 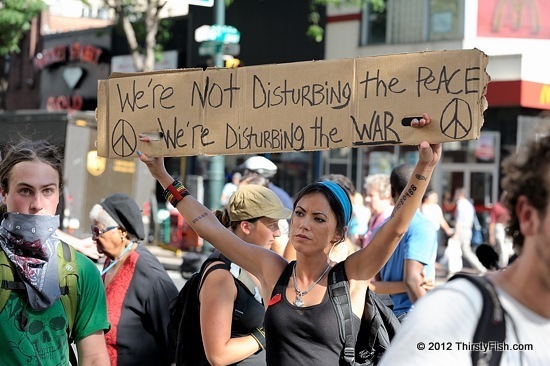 No one seemed to be disturbed by the protestors, except maybe few corporate security personnel: We're Not Disturbing the Peace; We're Disturbing the War! Ever since Occupy protestors were evicted from their encampments, they have had a hard time maintaining their visibility. The lack of, or, distorted coverage by the mainstream media has also hurt the movement. Although protest marches such as these give the movement some visibility, they seem to be doing little in educating the masses about how screwed up things really are, and how bad things are getting. As Chris Hedges points out, protest movements have a life of their own, and it is very hard to predict how and when things might shape up. The Occupy Movement has already successfully changed the policy conversation; It has drawn attention to income inequality, corporate greed, plutocracy, the destruction of the environment, and a host of other issues which were ignored by the mainstream media. The next step, imho, is to find alternative ways to educate the masses. A recent interview on Democracy Now! offers some tips from Spain's 15-M movement.